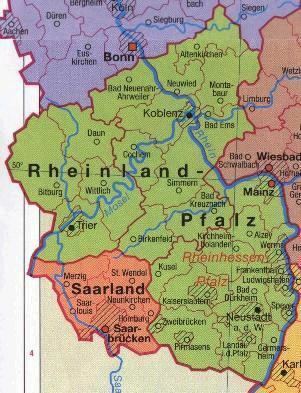 Rhineland-Palatinate (German: Rheinland-Pfalz, [ˈʁaɪ̯nlant ˈp͡falt͡s]; French: Rhénanie-Palatinat) is one of the 16 states (German: Bundesländer) of the Federal Republic of Germany. It has an area of 19,846 square kilometres (7,663 sq mi) and about four million inhabitants. Its state capital and largest city is Mainz. Rhineland-Palatinate is located in western Germany and was formed after World War II by the French military government from parts of regions historically not belonging together. The state has developed its own identity since, built on its natural and cultural heritage of extensive winegrowing, picturesque landscapes and its many castles. A referendum confirmed the state constitution on 18 May 1947. Rhineland-Palatinate shares international borders with France (Alsace, Lorraine), Luxemburg and Belgium (Liège). Within Germany it neighbours Baden-Württemberg, Hesse, Northrhine-Westphalia and the Saarland. It is the ninth largest state by area. Rhineland-Palatinate is part of the SaarLorLux euregion. With 42% of its area covered by forests it is the most forested state along with Hesse. 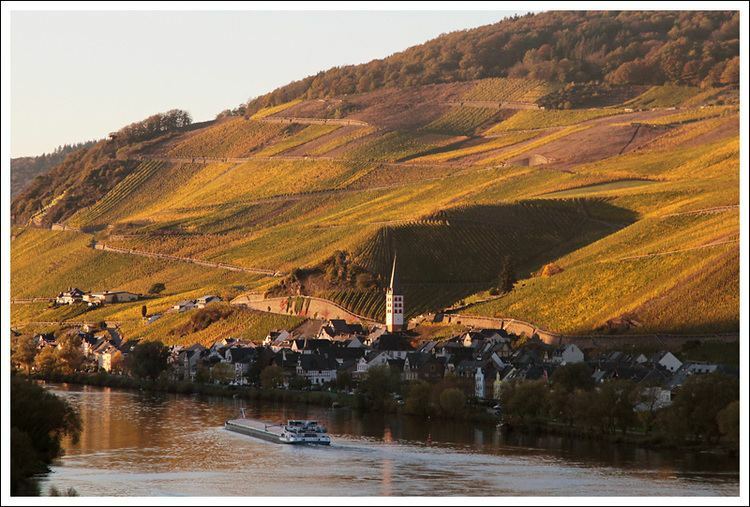 The state's major rivers are the Rhine, including the UNESCO World Heritage Site Middle Rhine, and the Moselle. There are several crater lakes of volcanic origin in the Eifel, the biggest of which is the Laacher See. The Rhenish Massif forms roughly the northern half of the state, including the regions Eifel, Moselle Valley, Hunsrück, Westerwald and parts of the Taunus. The Palatinate forms the biggest part of the southern half along with Rhenish Hesse. The Nahe Valley separates both parts. As of 2015, 42.2% of the population of the state adhered to the Roman Catholic Church and 28.5% to the Evangelical Church in Germany. 29.2% of the population is irreligious or adheres to other religions. Muslims made up 2.5% of the total. The league of ShUM-cities in the later Rhineland-Palatinate comprised the Jewish communities of Mainz, Speyer and Worms which became the center of Jewish life during Medieval times. The Takkanot Shum (Hebrew: תקנות שו"ם‎‎), or Enactments of ShU"M were a set of decrees formulated and agreed upon over a period of decades by their Jewish community leaders. Rhineland-Palatinate leads all German states with an export rate of approximately 50%. Important sectors are the winegrowing industry, chemical industry, pharmaceutical industry and auto parts industry. "Distinctive regional industries" includes gemstone industry, ceramic and glass industry and leather industry. Small and medium enterprises are considered the "backbone" of the economy in Rhineland-Palatinate. The principal employer is the chemical and plastics processing industry which is represented by BASF in Ludwigshafen. Boehringer, Joh. A. Benckiser, SGE Deutsche Holding, Schott Glassworks concludes the top 5 companies in the state. 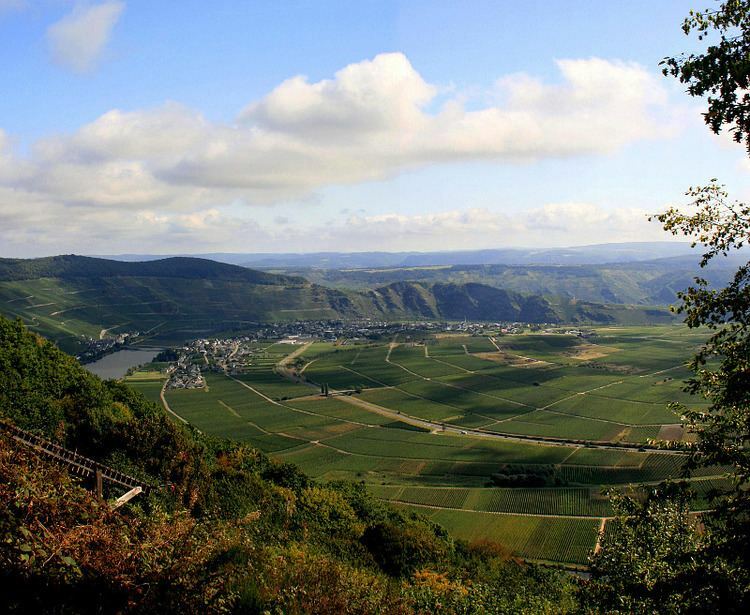 Of thirteen wine regions producing quality wine in Germany, six (Rheinhessen, Pfalz, Mosel, Nahe, Mittelrhein and Ahr) are located in Rhineland-Palatinate, with 65% to 70% of the production of wine grapes in Germany having their origin within the state. 13,000 wine producers generate 80% to 90% of the German wine export, which was 2.6 million hectoliters in 2003. Classical white varieties are cultivated at 63,683 hectares (157,360 acres). These comprise the famous Rieslings 14,446 hectares (35,700 acres), Müller-Thurgau (8,663 hectares (21,410 acres)), Silvaner (3,701 hectares (9,150 acres)) and Kerner (3,399 hectares (8,400 acres)). The state supports the wine industry by providing a comprehensive consultancy and education program in the service supply centers (German: DLR) of the land. The Geilweilerhof Institute for Grape Breeding is fully financed by the state. Many well known new breeds, such as Morio-Muskat, Bacchus, Optima and Regent have been created in these institutes. Other renowned sparkling wine producers, such as Kupferberg, Deinhard and Henkell, also had their roots in the region, but now belong to companies outside the state as a result of business consolidation.